* Drop-ins not allowed in the therapy class. Test Sara at 412-401-2162 to find out about and to arrange participation in the therapy classes. We offer a 20% university student & military discount. Bring ID to first class. Please pre-register and pay on the MindBody website or the MindBody app from your phone/mobile device, or simply pay at class time with cash or check made payable to IYIP. Come early to the first class to fill in the New Student Form and to get acclimated. Wear a t-shirt and shorts or leggings. Have bare feet and an empty stomach. Please do not wear perfume, scented lotions or scented deodorant products. Missed classes are to be made up in any other class during the same 12-week session in which they were missed. Payments made in advance for classes do have expiration dates. In cases of personal or medical emergency, classes will be converted to drop-in rates and may be used for private sessions. Private session pre-payments do not expire. These “level classes” each progress according to a syllabus which all of our teachers follow. It is suggested that you attend the full quarter in sequence to beneﬁt fully. (Classes within the same week may be interchanged.) All students should begin with Level 1 unless they have previous Iyengar yoga experience. Each new level introduces a new group of postures and is not necessarily more difficult, but rather, is more detailed, or more subtle, and builds upon the previous level’s work. Introduction for students new to yoga or new to the Iyengar method. Teaches standing postures, standing forward bends, twists and shoulder balance. Students may repeat this course up to 9 months then proceed to level 2. Level 1 classes are challenging and should not be considered “easier” than level 2. Prerequisite 6-9 months level 1 or the equivalent Iyengar method experience. This class introduces more complex standing postures, headstand, backbends and inversions. Students at this level must be practicing Sirsasana and Sarvangasana at home, and attempting to push up into Urdhva Dhanurasana. Students at this level should also have a basic understanding of how to self-correct and modify for any minor injuries they have. Permission from Christina is required to attend. No beginners, please. All specialty classes below are appropriate for beginners and may be used primarily, supplementally or as preparation for the more challenging “level” classes. This class will focus for 45 minutes each on the hips and shoulders. Learn postures aiming at full mobility and essential stability of the hip and shoulder joints. Excellent for those with pain or stiffness. Rest and breathe in supported postures to alleviate fatigue, reduce stress and tension, fortify the immune system, recover from illness and connect the body, mind and spirit. Wear warm, comfortable clothing. Supported chest openers are added to the pranayama practice to facilitate chest expansion and to improve lung capacity. Wear warm, comfortable clothing. For therapy students and students of all levels, including beginners. This accessible but challenging course will utilize the rope wall and other props to support a full range of classic asanas focusing on the creation of space, full mobility and essential stability in the hips and spine. Exploring the transition of darkness into light, each class will be divided in half. The first half will include heating, energizing chest opening postures to melt the stagnation of winter. The second half will balance the nervous system with deep rest and pranayama. This class uses yoga props to support the body for better alignment, for better opening of the joints and for teaching the receptive aspect of the postures while developing strength/stability. 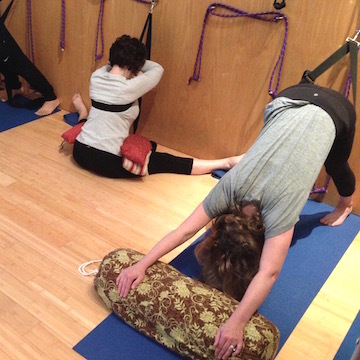 This class bridges the gap between relaxation and fully-active/classic asana work. Excellent for beginners, those fearful of beginning, and those with stiffness in the body. In addition to Supported Asana (see above), this class will introduce breathing/pranayama and supported, restorative postures designed for deep rest and healing. For therapy students and students of all levels, including beginners. This class is for beginners or continuing students recovering from injury or illness. Each student practices an individualized sequence designed according to the student’s specific needs. Text Sara at (412) 401-2162 to discuss participation before coming to class. This class is appropriate for beginning and continuing students who may need additional time and support to move into and out of postures. It introduces a range of asanas to improve mobility, posture and stamina. This time for individual yoga practice is open to all currently registered students. Sara, and some of the other teachers, will practice at this time. You may discover much by watching your teachers practice and may find it beneficial to practice with a group. Quiet is observed. No charge.